Krill can actually downsize their body size, if sufficient nutrients are not available. (Photo: NOAA) Click image for larger view. Just as there are growing seasons on land, there are growing seasons in the ocean. At Cordell Bank, the growing season begins in early spring when the first phytoplankon blooms (large increase of microscopic plants) of the year fuel growth at higher levels of the marine food web. In California, as in many parts of the world, euphausiid shrimp, commonly called krill, benefit from this early season production. Feeding on phytoplankton and small zooplankton, krill populations expand and become a critical link in many marine systems. Krill convert energy from the primary producer level into a form that is useable by animals in the upper levels of the marine food web. Krill often are referred to as keystone species because they play such an important role for many marine systems. At Cordell Bank, krill are a major food source for salmon. Krill pigments also give salmon flesh its characteristic pink color. Rockfish, seabirds, and a myriad of lesser known species all depend on krill. The main reason humpback and blue whales visit the Bank in the summer is to fatten up on krill to prepare for the rigors of the coming year. In many of the world's oceans, krill are a critical source of energy for seabirds, penguins, seals, sharks, octopus, and many species of whales. Currently, 85 species of krill have been identified in different oceans around the world. They live in habitats ranging from abyssal depths (5,000 m) to near shore kelp beds (10 m), and from warm tropical seas to the freezing Antarctic Ocean. The two most common species in the Sanctuary, Thysanoessa spinifera and Euphausia pacifica, are typically 15 to 20 mm long and probably live about two years. T. spinifera is found mostly in shallower water over the continental shelf. E. pacifica is usually found in deeper water toward the margin of the shelf and beyond. All krill live in the ocean water column full time. They have legs called swimmerets that look like small feathers and function like fins. This gives them great mobility and agility for life in the water column. Krill feed while swimming, using modified legs to form a food basket that separates food from the water while they swim. Most krill hatch from free-floating eggs and pass through larval and juvenile stages before maturing into adults. This development process involves a series of molts (casting off the rigid outside skeleton that restricts growth), during which segments and appendages are gradually added. While the new outside skeleton is still soft, the individual can increase its size. Adult krill have the unique ability to actually shrink in size after a molt if food resources are scarce. Because krill can increase and decrease their size, it can be difficult to determine their age or an age distribution from a population of animals. Many species of rockfish eat krill. Click image for larger view. 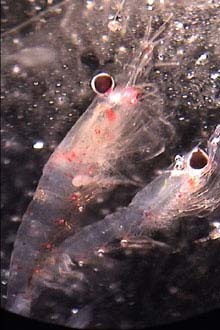 Krill typically are found in concentrated aggregations. Like many organisms that live in the water column, aggregations of krill in the Cordell Bank area are very patchy. Usually, one to ten individuals occupy a cubic meter of ocean. However, denser patches called shoals have concentrations of 10 to 100 krill per cubic meter, and swarms have 1000 to 100,000 krill per cubic meter. This schooling behavior is an effective defense mechanism. It confuses smaller visual predators that prefer to isolate and take single individuals. Within the aggregation, single krill are capable of some truly remarkable maneuvers. Researchers in the Antarctic have documented an amazing response by individual Euphausia superba. When the aggregation was disturbed by divers, krill scattered in all directions. Some individuals in the group instantaneously and synchronously molted, leaving behind only their floating exoskeletons. These castings presumably act as decoys to further confuse predators, allowing the krill to rapidly swim away, much like an octopus leaves behind an ink cloud. Swarming, however, does little to protect krill from the considerable risk posed by larger predators like great whales, who do not target single prey. Swarms can extend 10 m or more in diameter and often elicit a frenzied feeding response from whales and other predators like fish and birds. This is particularly true when these aggregations are in the upper water column, and escape routes are restricted by the ocean's surface. Swarm formations at or near the surface have been reported for 18 species of krill worldwide. In the Cordell Bank area, Thysanoessa spinifera demonstrates this behavior by forming large swarms at the surface during daylight hours. Swarming activity starts sometime in the spring and continues through the fall. Often, we can locate these aggregations by spotting flocks of diving seabirds or clusters of birds picking at the surface. Fishermen often use these feeding flocks to help them locate salmon feeding on the undersides of the krill swarms. Lunging humpback whales that break the surface of the water are also a good indication that krill are swarming nearby. Surface swarms provide ideal feeding conditions for these large filter feeders. With its huge, gaping mouth, a humpback can engulf a large volume of krill in a single gulp. These dense aggregations of prey provide the several tons of food per day that these whales require during the summer feeding season. Scientists are unsure why krill form huge swarms at the surface during the day when it makes them so vulnerable to predation. Both physical influences and biological cues likely drive this swarming behavior. Some scientists think that physical factors, such as passive transport by tides or ocean currents, drive krill to the surface during the day. Other researchers believe that krill swarm at the surface to take advantage of increased feeding opportunities associated with higher phytoplankton densities. Or perhaps warmer surface waters lead to faster incubation times and therefore, a higher rate of reproductive success. However, these behaviors vary by species and location. Likely, a combination of several factors that change slightly from year to year contribute to the behavior. But if biological forces are involved, the presence of this daytime surface swarming behavior must provide a net benefit for the species. Advantages gained by daytime, surface swarming must outweigh the associated costs of increased predation. Although they do not form daytime surface swarms in the Cordell Bank area, our other common krill, Euphausia pacifica, demonstrates a behavior that is equally fascinating. Each night, as if on cue, these krill rise from the deep ocean into the upper levels of the water column. As dawn approaches, they descend to ocean depths for the day. Many other organisms share this migration pattern. During the day, krill form part of the so-called deep scattering layer that fishermen see on their depth sounders. The timing of this daily event in response to changing light intensities provides E. pacifica with advantages relating to predation, feeding, energy and reproduction. By moving up at night to graze on abundant food, E. pacifica minimizes its exposure to certain daytime predators. They also conserve energy by returning during the day to the colder deep water where their metabolism slows and converting food into energy and growth is more efficient. In addition, releasing eggs in the warmer surface layers speeds development times and reduces the time exposed to predators. It also ensures that hatching larvae are in productive waters when they start feeding, thus increasing their chances of survival. Krill are a critical link in the marine food web in Cordell Bank National Marine Sanctuary, and in marine food webs around the world. They directly and indirectly support the survival of many animals living in different oceans around the world. Although scientists still have many questions about the population dynamics and the complex behaviors of krill, active fisheries are currently exploiting abundant krill populations in Antarctica. Experimental fishing to determine the feasibility of harvesting krill off the California coast also has been conducted. Although we know the key position filled by krill in many marine ecosystems, we need to ensure that their populations remain healthy for the well being of all.